Product Condition: The Ranger Cargo Short - Men's is in Excellent condition. This item was previously owned for 2 month. The following observations were made concerning this item. Regardless of what the day has in store, the Ranger Cargo Shorts are equipped to handle it. The Ranger Cargo is Fox Racing's do-it-all trail option that's upgraded with increased storage capacity and, for 2018, a more pedal-friendly fit. Despite those changes, it's still built with the features that made its predecessor such a common choice. 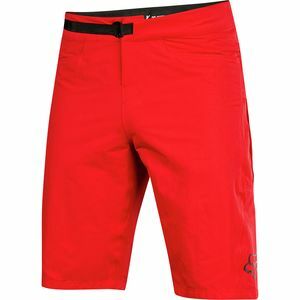 The new Ranger Cargo is made with the same midweight stretch fabric, which breathes well and fluidly flexes while pedaling on climbs and throwing whips over hits in the bike park. The detachable liner returns, too, offering a bit more support on longer rides with its EVO chamois easing the effects of trail chatter over a day spent on dirt. Roomy cargo pockets secure your smartphone and energy bars within close reach, allowing you to quickly switch tracks and fuel up after a leg-burning climb, and a zippered pocket keeps the all-important car key safe.